I got lucky - sort of - and no, not that way. My ‘99 TJ got rear ended. Molly and I were both in the Jeep when it happened. I was stopped and the Toyota truck that hit me was going 75 mph or better. Molly and I are fine. The ‘99 was not so good. Yeah, I had lots of heavy bracing in the cage and underneath but, still, that was a hit. The frame was so bad that I was going to need a new one. How’d I get lucky? Besides the fact that my dog and I are fine, I got to go buy a new Jeep and start over. In addition, I get a chance to try some new products! Rear bumpers can be important. 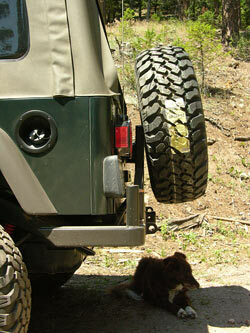 Seems as though everyone and their dog has an idea for a rear bumper. Furthermore, many ‘wheelers actually like to make their own. I’m not that good of a welder, I don’t have a lot of free time, and I wanted a product from someone that does have experience making things and does know what they’re doing. I also wanted something that was simple. I really did just want some thing that I could bolt on and then trust to do the job. I also wanted something just a little different and unique. Here comes Big Daddy Offroad! I’ve heard the name “Big Daddy Offroad” and had seen some of the products, so I jumped at the chance to preview their newest offering, the Rock Rear Plus Bumper and Tire Carrier. 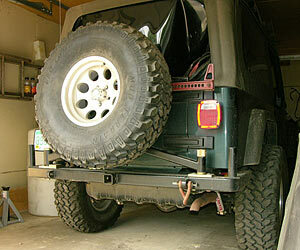 This is their newest rear bumper that was made to replace the “Rock” bumper. The bumper came in one box and the tire carrier in a second box. Somewhere between North Carolina and Colorado the tire carrier box got a large hole in it. I got lucky again. The folks at Big Daddy actually package all of the small bolts and brackets and things in a box all their own, so no parts were lost. I have had other similar products where they just throw the loose bags-o-bolts into the box without much thought. Had that been the case here, more than likely, the things needed would not have been there. It’s a small thing and I’m sure it’s an expense to the folks at Big Daddy, but it meant a great deal to me to not have to chase down parts for a new bumper that I was excited about getting on the Jeep right away. As with any project, it’s always more fun with a friend. I got lucky last year when Rockcrawler.com staffer, Shawn Pagan moved to my area. He’s a real talent, a nice guy, and was fine with coming over for the install. We unboxed the bumper and carrier and, to my delight, found that there really is not much to this installation. The folks at Big Daddy have really thought well of whom they want to make this bumper for. In business talk; they know their target market well. 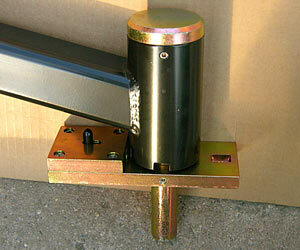 This whole system is designed for ease of installation and long-lasting durability. The first thing Shawn said was “nice powder coating,” and it is. The product is made to last. I noticed that there were some parts that looked to unique to Big Daddy items, meaning not off-the-shelf. The hinge, the latch, the catch, even the plate that the tire mounts to was unique. In the pictures you will notice the brass-looking items (actually, all those parts are zinc-plated) are all unique to Big Daddy. 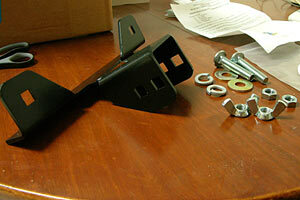 They actually make all the parts for these bumpers right there in-house. They don’t go buy just any old spindle and hub and then piece it together into a bumper. Each part is made with a purpose in mind. The cool part, though, is that if you ever need bearings, these are standard model numbers and you can go to a parts house and buy those. There’s so much to cover on this bumper! The carrier bearings are in a sealed housing, so there is no need for continual greasing. The unit comes already packed with grease and is ready to go. Most other carriers that I have seen have zerks and need to be cleaned up from time to time. The last carrier I bought needed to be greased at assembly. Sure, most four-wheelers have grease guns, but for the folks out there that do not, it’s just another thing that they need to take care of. The fact that it is all sealed means that you’ll never have a greasy mess there to collect dirt. Better yet, the elements of weather that harm bearings won’t get in. We read through the instructions. Yes, for most folks the installation is so simple that they will never need to even look at the instructions. We wanted to see if everything was covered, so we did actually read them. The first step was to read through all of the instructions once before installation! We held the frame stiffener in its location on the inboard side of the cross member and the bumper itself up to the cross member and sized up the whole deal. It turned out that one of the lower tabs for where the 12mm bolt goes from the bottom into the under side of the frame needed to be “adjusted” ever so slightly. Then we put all the bolts in and they all lined up nicely. This is always a big plus for me. I never enjoy having to pull out my tools to modify something that is brand new and should have been thought out and tested well enough before it was placed on the market. So, thank you Big Daddy for making life easy. Once all of the bolts were in place we tightened them all up and that was it for the install for the bumper. The bumper itself is very nicely thought out. For the Wrangler Unlimited with their additional length behind the rear tires, I was somewhat worried about the potential to land on boulders with that rear quarter panel. The Rock Rear Plus Bumper actually wraps around under the tub to protect that area. 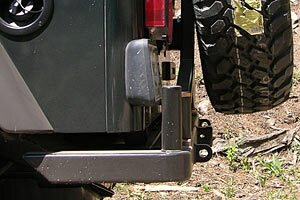 The bumper has a receiver in the middle and two D-ring tabs welded into the bumper right where the bumper mounts to the frame, which would be the strongest location on the bumper. These things are beefy - I mean they are fully-boxed steel bumpers. 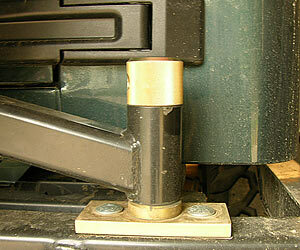 The Rock Rear Plus Bumper also comes with posts for corner protection. With my ‘99 I did manage to get into a couple of places that just caught my corner guards and since I have yet to get corner guards for this Unlimited, and the fact that I now have more rig following behind me, I like the idea of those posts. Maybe on this Jeep I’ll even be able to keep the license plate bracket in better shape. I noted something about the receiver on the bumper. Some receiver pins do not fit in the pin hole, as the hole is very tight. The good side of this is that you won’t have the loose slop that some receivers have. The down side is that you might need to be particular about which pin you use. Big Daddy supplies short bolts for fastening the frame stiffeners to the frame. You need to be nimble fingered to get those nuts in there and onto the bolt. A nice thing about the Big Daddy instructions is that right up front you get a parts list to compare against the parts that actually arrived. I always recommend going over this list before you actually start the work in case something is missing. One of the coolest things that I liked about Big Daddy is that the tire carrier (which does have many small parts) comes almost fully assembled. You will notice in the picture of when we first un-boxed the items that the pivot is not something that you will need to put together. Again, I’m sure that it takes extra time at the factory for them to do the assembly, but I appreciate not having to learn how to assemble the device. 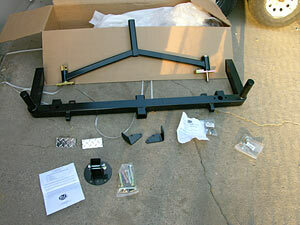 The first step in the instructions for the tire carrier is to remove the diamond plate trim pieces (if installed). You can buy the bumper and carrier separately. If you do purchase just the bumper, Big Daddy includes some trim pieces to cover the holes in the bumper that are there for the installation of the tire carrier. It’s just one more little thing that the folks at Big Daddy do differently. The next step is to drop the carrier into its’ respective holes on the bumper. This is the point where Shawn and I noticed something was different. 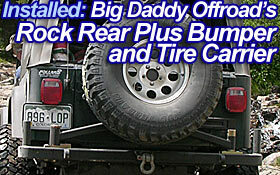 The Big Daddy carrier is hinged on the left instead of the right as are most other bumpers that we have seen. 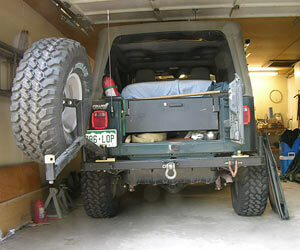 The reason for this is so that when the carrier is open, the Jeep tailgate does not bang against the carrier. For some, the idea of saving the paint and the tailgate from damage is a nice feature. The thing that I like about the left hinge is that, traditionally, all TJ’s seem to sag on the right rear spring. With the additional weight of the open carrier it really leans. Not so with the Big Daddy set up, since the weight shifts to the driver’s side. The tolerance of the spindle shaft and the hole in the bumper is nice and snug, we needed just the right amount of pressure to get the pivot base in place. We installed the carriage bolt and moved on to the next step. We rotated the carrier to its closed position and put the carriage bolts in their respective holes on the closure end and checked to make sure that the screw pin operated correctly. All fit perfectly and we tightened everything down. Oddly, that’s where the instructions stopped. We still needed to mount the part of the carrier that actually holds the tire. No big deal, though, as it pretty much fits only one way and there is a choice of bolt locations for adjustment toward or away from the vehicle. There is also a choice of bolt patterns for 5 on 4.5 or 5 on 5.5 wheels. We made all the choices that suited us and that was it for the install. Again, the things that impressed me were how well the whole system is made and how easily it all goes together. You really do not need the instructions, but you should always read them anyway. There is a slot that catches the carrier when it is open to 90 degrees. This is a nice feature that my last carrier did not have. It seems that when I have been out on the trails that any time that I have needed to get into the back of my Jeep, the rig is never on level ground. It’s always a pain trying to hold open a tire carrier and the tail gate and get at whatever it is that I need out of the back without it trying to close on me. The last time I talked with Mike Wrike at Big Daddy he told me that they were going to include a second catch notch that would allow the carrier to be open all the way to the bumper post, as well, which is a great idea. Though there is adjustment in and out on the plate that holds the tire, Shawn and I both would like to see the tire all the way up to the carrier frame itself, just for the added stability so that the tire does not wobble on the trail, and to keep the tire as close in to the body of the Jeep as possible. Sometimes that additional overhang makes the difference of hitting the tire on the ground or not on some climbs. We noticed that the tire itself sits lower to the ground now. In other words, the spare tire’s weight is now lower, affording a lower center of gravity and better visibility out the back of the rig. The tradeoff, once again, would be the chance of hitting the tire on some obstacles. You will notice from the pictures that the tire does sit at a slight angle from plumb on the carrier. This has been done to lessen the chance of hitting on obstacles. It did not take us very long to install all of this and we were even taking pictures and swapping stories as we went along. It seems that from start to finish that it really should take no longer then an hour to an hour and a half for the complete installation. We thought we were finished and I called Big Daddy the following day for some follow-up questions on why they did certain things, what we noticed, tell me more about this and that, and that sort of thing. 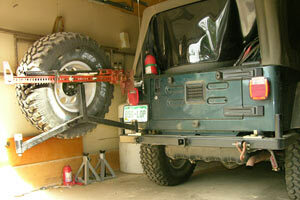 In the process, I learned that there was a Hi-Lift jack carrier that was just being finished to add to the mix. I happen to have a Hi-Lift and have never had a satisfactory way to carry the thing. I have seen other carriers that have tried to address the Hi-Lift and have had limited success. So, Big Daddy sent me the bracket to add to my setup. Installing the Hi-Lift bracket involves removing the bolts from the adjustable tire holder and then placing the jack mount holder over the tire holder, reinserting the bolts and tightening them up. You get two long carriage bots that go into the jack holder and you tighten those to the holder and then install the jack by placing the jack over the bolts and securing with some large wing nuts. Again, this was all well thought out and simple. The jack fit well and snugged up nicely to the tire so there should not be any rattle. I did make sure that my cotter pin on the Hi-Lift base was secure and I used a strap to make sure that the handle of the jack was secure. While installing the jack holder I did notice that when tightening the jam nut that holds the carriage bolt in place, it is a good idea to use a Crescent wrench to keep from bending the holder. My personal thoughts on this bumper carrier arrangement are that the designers thought it out well and that whoever buys these units will love the ease of installation and the quality and fit. I have already been stopped by folks around here wondering who made the bumper. 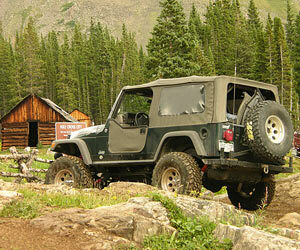 One of the folks asking was the long time owner of a local 4x4 shop in Ft. Collins. I’m going to give this a long-term test over many of the hardest trails in the country so stay logged on to Rockcrawler.com and feel free to contact me along the way.